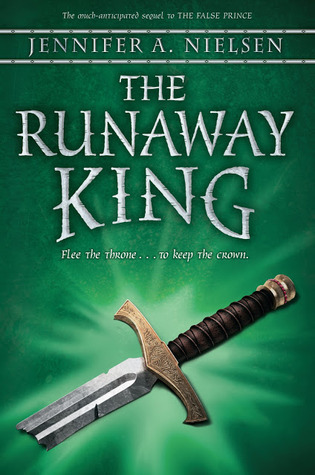 The Runaway King is the follow-up to The False Prince. The False Prince was my favorite book of 2012. I've already read it 3 times! The Runaway King is just as good as its predecessor, although in a different way. Sage has ascended to the Carthyan throne. But of course his problems don't end there. To thwart a planned assassination and threat of war, Sage goes on the run. But Sage isn't running from anyone. Instead, he's running to the culprits to beat them at their own game. I often felt like I was reading a book featuring a brand new character in The Runaway King. Sage was so different than in The False Prince. He was more doubtful, scared, and prone to do stupid things. But the more I thought about it, the more I realized Sage was exactly the same. Due to the nature of The False Prince, Sage hid most of his inner thoughts and emotions from the other characters but also from the reader. He came off as cocky and supremely capable when in reality he was probably just as nervous as he is in The Runaway King. Not to worry, Sage is incapable of being a withering daisy. He still has a smart-aleck comment for every situation. He still manages to get himself into and out of impossible difficulties. Nearly all our favorite characters from The False Prince play a role in The Runaway King as well as a few new people. Sage is reluctant to trust anyone or accept help. This is the book where Sage realizes that he is stronger when he has the support of his friends. Mott and Imogen serve as Sage's closest friends and advisers - the ones who will tell him when he's being an idiot, but do their best help him anyway. I loved seeing how Sage's relationship with Roden evolved. The Runaway King is just as full of action as The False Prince. In fact I think there's more. It took a few chapters to get going, but once it did, I was glued to my iPhone/Kindle. The False Prince was predictable in many ways - well, to pretty much everyone except for me...I was completely surprised. The plot in The Runaway King shifted again and again in directions that few readers would expect as Sage ingratiates himself with the pirates. As in The False Prince, romance is deemphasized. There's a hint of a love triangle, but it's so subtle that even the most fervent love triangle hater won't be bothered. It's rather refreshing to read an adventure novel that values action above romance. The Runaway King is a must read for anyone who loved The False Prince. And if you haven't read The False Prince yet, shut your computer down and pick it up! With both books, you'll laugh at Sage's sarcasm, gasp at the surprising plot turns, and smile as you go for an amazing ride. I'm reading this one soon but I think I'll reread Flase Prince first to jog my memory. I wish could erase my memory of the plot of False Prince so I could surprised all over again (didn't see any of it coming). Anyway glad to hear Runaway king is just as amazing. I'm a fervent love triangle hater so the subtle romance is definitely good. Thanks for the great review Alison! I haven't finished reading my copy yet, but you make me want to pick it up right now! I really miss Sage and I can't wait to read more. I haven't read the false prince yet, but I am def thinking about it, sounds like a great series. I didn't love, love, love THE FALSE PRINCE, but I am interested to see where the plot goes in the next book. Glad it lived up to your expectations! I really have not heard much about this series at all but your love for the first book and now this sequel have me very interested! I have a copy sitting beside my bed right now. I'm planning on rereading and reviewing The False Prince first because it was so epic. I just reread that one "OMG" chapter whenever I feel the urge to read it again ;) Ugh I can't wait to read The Runaway King. SO GOOD! YES! I LOVED this book! I agree that he's a very different character but I loved him! I think I liked this book more than the first and liked seeing a bit more of the world. I'm definitely going to reread this series! I've had a few bloggers recommend this book to me. Now, I must read it. I love adventure and I'm glad that the love interest triangle is subtle. I think I liked The Runaway King even more than I liked The False Prince because we are allowed to see more of Sage/Jaron’s thoughts and feeling. It makes you realize how much of his success is just pure dumb luck and bullheadedness. I can’t wait for book number three and the war. I loved The False Prince, so I really need to get this one! Glad to hear it's action packed and that the love triangle isn't prominent enough to be annoying. Wonderful review! Lovely review! I haven't read The False Prince, but I have heard great things about it! I was kind of weary, because of the middle grade-ish feel about it. Yeah, I know! Wha you've read The False Prince 3 times already?! Okay OKAY I'll read it already (I do already own it after all)! Just need to find the time. But this review is SO encouraging so I really feel the need to try to make it happen so then I can read this one, too! How funny, I checked this one and the first in the series out of the library this past week. I'm going to bump them up in line now!